Does bargain hunting give you a thrill? Well, then you are in for a treat. 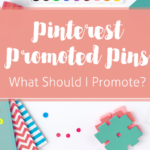 Today I’m going to let you in on my approach for Promoted Pin campaigns with the aim of getting you the best results for the least amount of money. This is what I do for my clients – and you can do it, too! When Pinterest Promoted Pins first came out, they were cheap. We’re talking easy clicks for $.05. So, adequate tracking, planning, and testing seemed like a bit of a waste of time. No longer! But there are still deals to be had, and at the very least, you can avoid paying more than you need to. 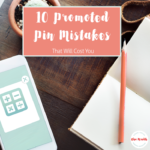 Make sure you also check out my article on 10 Promoted Pin Mistakes That Will Cost You. OK, let’s go! Rule #1 for not overspending is to know what works and what doesn’t. The spaghetti-against-the-wall method doesn’t cut it – especially when your hard-earned cash is at stake. So, get Google Analytics set up, Install your Pinterest conversion tag, create your goals, and get comfortable with UTM URLs. If you’re going to be selling items, use Pinoculars (affiliate link) for Woocommerce, Shopify, or Easy Digital Downloads. Or, you can hire a programmer. Don’t skimp here. I recently had a client whose setup took five hours because they were using multiple programs like ConvertKit, Leadpages, etc. Trust me, it’s worth it for you to know what’s working. 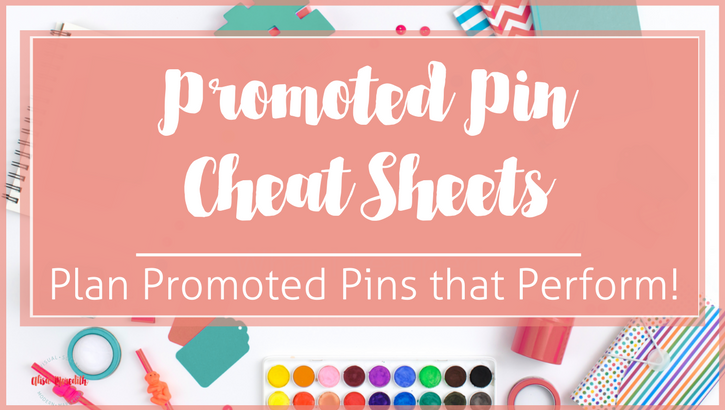 Rich pins perform better overall, and with Promoted Pins, they’re a must. Get yours set up before you promote. 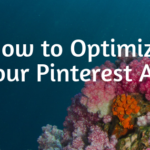 This involves a deep dive into what on your website is converting with people coming Pinterest. Is a certain blog post or landing page converting to a high number of subscribers? Are Pinterest visitors purchasing one or two items much more frequently than others? Which pages lead up to those conversions to email subscribers or sales? Learn more about the process here. 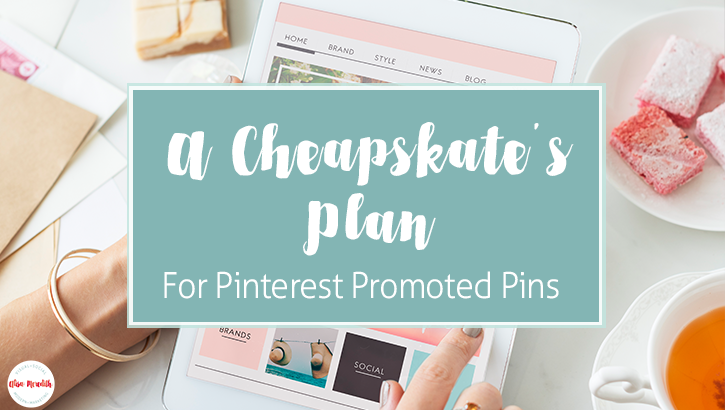 Go with a daily budget rather than a campaign budget – you don’t want Pinterest blowing through it all right away! If you have a set amount for the entire campaign, spread that out over at least 30 days. I start low with CPC. The actual figure will vary by industry, but I’ll often start at $.15 per click. How much should you spend daily? Aim for at least $5/day. 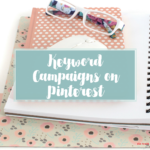 By the end of the month you’ll have some idea of what is working, and with extra, unpaid traffic coming in from people repinning your pins, it really takes that long to get a true picture of the performance of your campaign. Just don’t spread that $5 out too thinly across many campaigns and ad groups. Less than about $2/day makes it hard to identify patterns and adjust for improved performance. If you have ecommerce tracking set up in your Google analytics, you’ll be able to tell which visitors from which devices are actually converting into buyers. In a recent case, I saw that web, iPhone, and iPad visitors converted to customers at a dramatically higher rate than those visiting from other devices, so I elected to display these campaigns to only people on those devices. It’s similar if your conversions are email sign ups. In Google Analytics, go to Acquisition > Campaigns > All Campaigns Choose your campaign or look at all of them and set the Secondary dimension to Device Category. Take note of which traffic is converting – web, tablet, or mobile. Then change the secondary dimension to Mobile Device Info to see exactly which phones and tablets are converting. Visitor, Email, and Engagement audiences will bring in your highest conversion rates at the lowest price. Interestingly, I’ve seen email audiences outperform visitor audiences AND vice versa. So, assuming you have enough traffic and email contacts, try both. Engagement audiences will likely not be quite as highly converting, but they’ll be better than keyword or interest targeting, and likely cost a whole lot less as well. 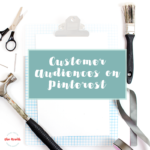 If your audiences are small but Pinterest can find at least 100 pinners for each, use them! You will likely not get as many impressions as you want, but let it run for at least a week. At the end of that week, look at which audiences perform the best. Create actalike audiences for those and set up new ad groups to target those as well. Your click-through rate may decrease at this point, but not too much. My “cheapskate” approach brought the cost per click from $.24 down to $.12 and the click through rate from .08% up to .3%. Now, no one is going to be happy with 51 clicks, but we’re just getting started! Now that we are reaching the easiest, cheapest audiences, it’s time to branch out. This was enough activity to show me which audiences should spawn actalikes. Now I’ll let that run for a week. From there I’ll add larger actalike audiences. You can target from 1%-10% similarity, so my next audience might be a 2%, but to avoid competing against myself and annoying my 1% with too many ad impressions, I’ll set up the new ad group to include the 2% actalike and exclude the 1%. Still not getting enough impressions? Keywords and Interests can be effective targeting methods, but they’re not going to come close to your own and actalike audiences in terms of click-through rate and low cost per click. Interest targeting can convert really well – it just depends on whether or not your content fits one of them. Go ahead and target 30-40 keywords, too. Just be aware that keyword targeted campaigns don’t necessarily show up when someone searches for your content. I know. You’d think it would. It’s more loosely targeted to pinners based on their activity. So, it doesn’t do a great job hitting their search results when there might be buying intent. Now that you have the full spectrum of targeting covered, start upping your bids just a bit if needed. How do we know if it’s needed? I look at my average cost per click, and if it’s real close to the maximum I set, it’s safe to say the campaign could be improved by upping that cost per click bid a bit. You only have to outbid the next highest bidder by $.01, so don’t feel you need to go crazy! If an ad group or just one image in the ad grup is just not working, that is, your click-through-rate is abysmal but you’ve had plenty of impressions, stop. If you’ve used Facebook advertising, you know that a low relevancy score will increase the cost of your ads dramatically. It’s the same thing here on Pinterest. If your ad is not resonating with people, Pinterest will charge you more and more for clicks, or just stop showing it altogether. Pause, regroup, redesign your image and/or rethink your targeting. 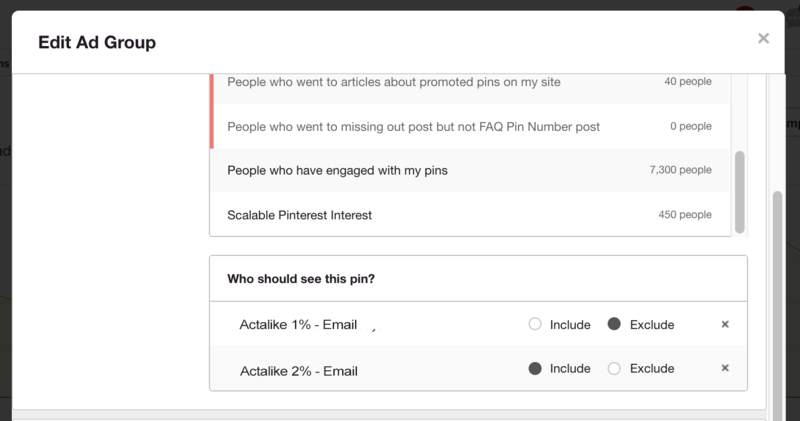 If you are targeting multiple interests or keywords, go to your dashboard and get to the individual pin level to see which of those are working and how much each is costing. 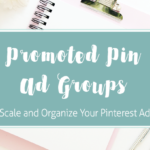 Make a note of that for each pin in the ad group, then edit your ad group to remove the underperforming targets. If you have a list of 15 keywords or interests in your ad group and 14 are doing OK, but ONE has a very high click through rate and super low cost per click or effective cost per click, consider making a new ad group just for that high-performing keyword or interest. Put a bit more money behind that one and see if you can capitalize on its success. Remember when we set up all our tracking? Make sure you put it to good use. Clicks are all very nice, but if they’re not turning into sales or leads on your site, you need to either make your pages more convertible, or stop sending Pinterest traffic to that page. Feeling a little overwhelmed? I can help you out at any stage of the game, and you are most welcome to pick up my Pinterest Promoted Pin planner. I like to have my clients’ campaigns all written out before I even open up the ad dashboard. It’s great for making notes on the adjustments you make, too! Do you have any money-saving tips I may have left out? I’d love to hear about them in the comments!